First of all, let me give you some context. I saw ‘Clash of the Titans’ at the age of 6 in theatre, and being a youngster of such an impressionable age the film has stuck with me as a seminal part of my childhood. Though my memories of the viewing experience are sketchy, I do remember, even at a young age, noticing the sloppiness of its special effects. After all, I had already seen ‘Star Wars’, ‘Empire Strikes Back’, ‘Star Trek: The Motion Picture’ and ‘Superman’ in the theatre and so even back then I could discern that those hand cranked special effects weren’t up to snuff compare to those other films. But I also recall that not distracting me from the enjoyment of the film. Though made in 1981, Ray Harryhausen managed to make a film which looked and felt like one of his adventure classics from the 50’s and 60’s – Jason & the Argonauts as the more directly comparable. Well timed properly with the new Louis Leterrier version of the film, comes a Blu-Ray edition from Warner Home Video. Watching it after all these years confirms my impressions as a child. Harryhausen’s use of stop motion combined with matte and model photograph results in many of the same familiar compositions to used in ‘Jason and the Argonauts’ or the ‘Seven Voyage of Sinbad’ – sectioning off the frame into two halves, one for the live action and the other for the stop motion. While these moments aren’t neatly sewn into the fabric of the live action as CG graphics can do in today’s films, or even how Dennis Muren did back in the late 70’s early 80’s with the more expensive effects films, there’s an unmistakable pleasure in watching Harryhausen’s work. The movement of stop motion has always marvelled me because it’s a hybrid of traditional animation, and live action. Unlike CG the creatures created in stop motion are tangible three-dimensional objects with texture and grain and our eyes recognize this no matter how jerky it may be. The film also features some admittedly awful worst blue screening. The scenes of Poseidon unleashing the Kraken for instance features a no frills superimposition of Jack Gwillim laid over an underwater shot of a gate opening. Bad matting lines can be seen surrounding the actor, who is shrunken into a tiny corner of the frame, In hindsight, these moments we have no problem forgiving as b-movie pastiche and nostalgia. Despite the humour camp, there’s actually some solid fantasy storytelling at work. By following closely the Perseus myth, it's difficult to go wrong. In the opening Perseus (Harry Hamlin) who was the favoured half-human, half-God son of Zeus (Lawrence Olivier), is saved from ritual slaughter at young age by Zeus and brought up under protection of himself and the other Gods of Olympus. But when Thetis (Maggie Smith) requests that her own earth-bound son Calibos be forgiven for his crimes and spared punishment, Zeus denies her and deforms the once handsome hero into a grotesque beast. This sets off a conflict between Zeus and Thetis with Perseus caught in the middle. Perseus finds himself armed with heavenly weaponry from the gods which he uses to fight off Cerebus, giant scorpions, Medusa, The Kraken and his arch enemy Calibos in order to save the girl. Calibos for instance makes for a wonderful villain. We never see him as a handsome man, just the beast form, but considering the fact that he used to be engaged to Perseus’ new love Andromeda, Calibos’ goals and desires are deepened further than being a mere beastly villain. The Greek violence is especially brutal – again, Calibos takes much of damage specifically when Perseus chops off his hand as an offering to Andromeda – now THAT’S cruel! The truly magnificent Medusa scene generates some spine-tingling suspense, ends with a nasty head chopping and some fun blood oozing from her dead corpse. The acting collective all appear to be having fun with their roles. 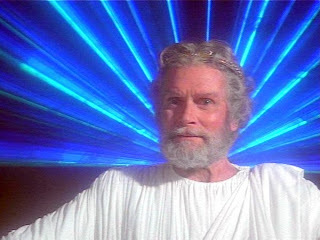 Lawrence Olivier as Zeus is both paternal and egotistical. Same with Thetis as played by Maggie Smith. The fate of her son is tragic from her point of view we understand her desire punish Zeus through Perseus and Andromeda. Under direction of Desmond Davis and producer Charles Schneer "Clash of the Titans' showcases best Harryhausen’s innate skills in cinematic spectacle, in what turns out to be one of the better 80's fantasy movies.